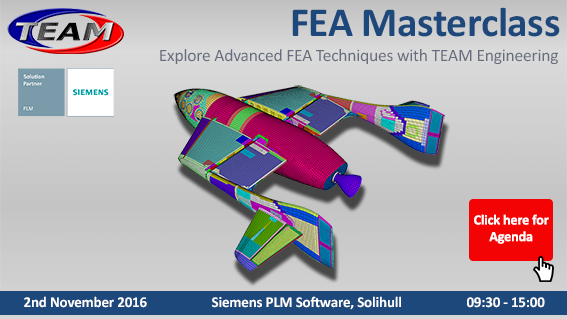 TEAM Engineering invites you to an interactive event focused on getting the most out of your FEA tool set. We will explore various Simulation techniques and best practices in an interactive session for both experienced and inexperienced Engineers. As part of this informative day, we will be showcasing the very latest in solver technology from Siemens PLM Software. These techniques on show will highlight many ways where you can save engineering time whilst still maintaining solution accuracy. The event will run from 09:30 to 15:00 at Siemens PLM Software, Solihull. * Register now to guarantee your place. Entry is subject to availability. * Lunch and refreshments will be provided on the day. * Free parking is available on site.